The Islamic Revolution Guards Corps (IRGC) Navy on Tuesday brought into service a new high-speed military vessel with an immense operational range and the capability to carry helicopters. The new vessel joined the IRGC Navy’s fleet during a ceremony in Iran’s southern port city of Bushehr. 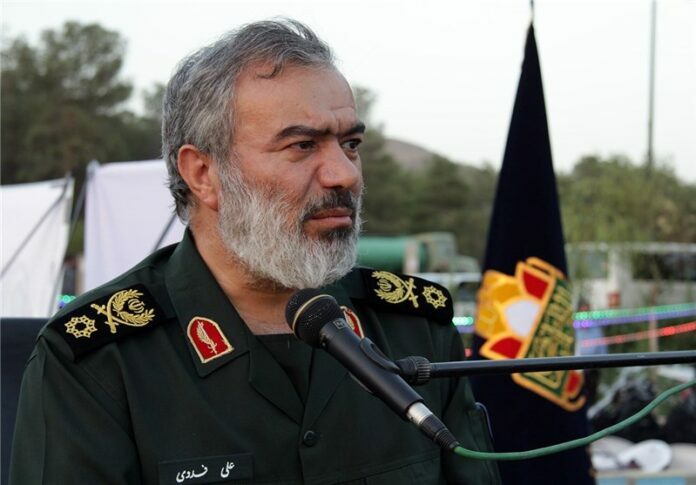 Named after Mohammad Nazeri –commander of the elite commando units of the IRGC Navy who was martyred in May- the new vessel is the biggest Iranian aluminum-hulled ship, IRGC Navy Commander Rear Admiral Ali Fadavi said. With a length of 55 meters, the high-speed vessel has an operational range of 10,000 kilometers, the commander noted. The Iranian watercraft can accommodate 100 passengers and carry a helicopter on board, Fadavi added, saying it can also sail into rough seas. Nazeri vessel, designed and manufactured by local experts, will allow for the IRGC Navy’s stronger presence in high seas and oceans, he went on to say. The IRGC has in recent years acquired technical expertise in the production of speed boats. Back in May 2015, Rear Admiral Fadavi said his forces were testing military speed boats with the breakneck velocity of 110 knots (203 km/h). The speed boats are seen by many military experts as the IRGC’s trump card in case of any direct confrontation with US warships. The IRGC Navy says the security of the Persian Gulf will be ensured without the presence of foreign forces, particularly the Americans.